In a study published in the AACR’s journal Cancer Research, a team of researchers from Australia showed that an optical fiber-tip probe that can detect the pH of a tissue can distinguish between cancer and normal tissues at the margins of a tumor during surgery, in real time. The probe is simple to use, can produce results in less than a minute, is cost-effective, and easily portable, the authors note. Because this pH probe has the potential to help surgeons avoid removing too much healthy tissue during surgery and also avoid performing additional surgeries later to remove any cancer tissue left behind, it has the potential to improve patient outcomes. A major challenge that cancer surgeons face currently is that there are no reliable methods to identify the tissue type during surgery, says study author Erik P. Schartner, PhD, a postdoctoral researcher at the School of Physical Sciences and the ARC Centre of Excellence for Nanoscale BioPhotonics (CNBP) at The University of Adelaide in Australia, working in collaboration with the Breast, Endocrine & Surgical Oncology Unit at the Royal Adelaide Hospital. The surgical procedures, therefore, rely extensively on the experience and judgment of the surgeon to decide on how much tissue to remove around the tumor margins, Schartner says. Because of this, surgeons often perform what is called cavity shaving, which can result in the removal of excessive healthy tissue. On the other hand, many patients do not have the entire tumor removed during the initial surgery, and will need a follow-up surgery to remove residual cancer tissue. “This is quite traumatic to the patient, and has been shown to have long-term detrimental effects on the patient’s outcome,” Schartner adds. Erik P. Schartner, PhD, whose research team at the University of Adelaide in Australia has developed a fiber-tip probe that can detect the difference between healthy and cancerous tissue during surgery. Schartner and colleagues hope to conduct a clinical trial of the device soon. “We have designed and tested a fiber-tip pH probe that has very high sensitivity for differentiating between healthy and cancerous tissue with an extremely simple experimental setup that can already be used in a fully portable configuration,” says Schartner. “Because it is cost-effective to do measurements in this manner compared to many other medical technologies, we see a clear scope for broader use of this technology in operating theaters,” he notes. Optical fibers are commonly used in medicine for imaging, such as endoscopy, and are being explored for use in chemical and biological sensing, Schartner says. His team designed an optical fiber probe that exploits the fact that tumor cells and normal cells have different pH, a measure of the acidity or basicity (alkalinity) of a substance. Tumor cells are typically more acidic than normal cells, Schartner notes. When the probe is applied to the tissue, the pH indicator embedded in the polymer layer at the tip of the fiber optic probe changes the color of the light it emits depending on the pH of the area that it is placed in. 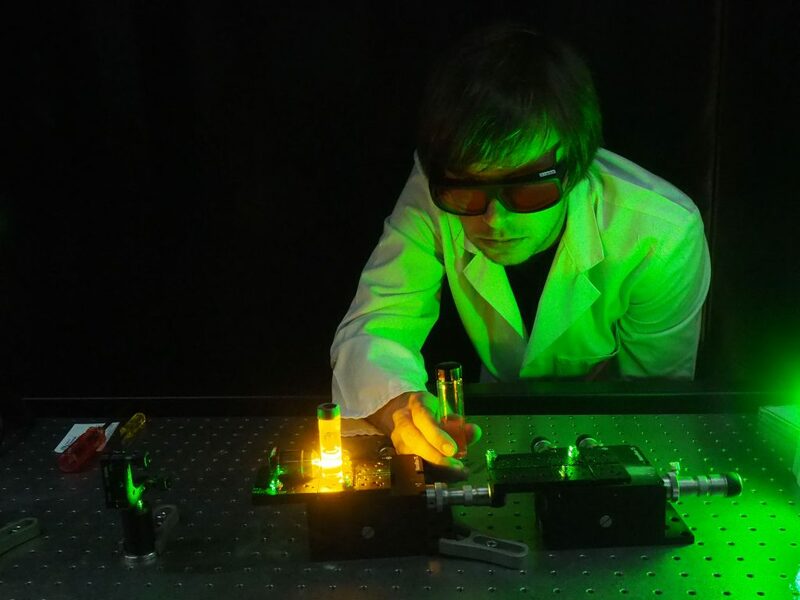 The probe is connected to a light source, which emits fluorescence that can be detected with a miniature spectrometer on the other end of the probe, Schartner explains. The researchers tested their probe on a few breast cancer and metastatic melanoma tissue samples and found that the pH method was able to differentiate tumor and normal areas with 88 percent sensitivity and 90 percent selectivity. Most biological cells can emit light by themselves, a phenomenon called autofluorescence. In order to avoid interference in measurements from autofluorescence, Schartner’s team used a “lift and measure” technique. To do this, the probe is first made to touch the tissue, but the fluorescence is measured after the probe is lifted from the tissue surface, at which point the probe retains the initial measurement but is devoid of the interference from the light emitted by the tissue. “Eliminating the autofluorescence background by the ‘lift and measure’ method we used overcomes one of the main limitations that usually restricts the performance of fluorescence-sensing methods,” Schartner notes. With their probe, the initial signal was stable up to 10 minutes after lifting. Schartner and colleagues are currently collecting more tissue samples to test and improve their probe’s sensitivity and accuracy, and they are hoping to conduct a clinical trial soon. “We are pushing strongly for commercial development of this probe with industry partners,” notes Schartner.